Sleepy at the start line at the Ferry Building. Due to the government shutdown, this year’s Bridge to Bridge 10K course was altered a bit, but the beautiful weather made up for any inconvenience in last minute changes. In a technological hiccup, Jesse jolted awake at 7:30am after my iPhone alarm (which I had set as my weekday alarm) had failed to wake us up at 6:30 am. After a hurried morning of attaching bibs, applying sunscreen, and charging Garmins, we made it to the start line in front of the Ferry Building before the 9:00 am race start. Jesse seeded himself up toward the front, where he and his fellow speedsters could run without the perils of the slowpokes like me slowing him down. 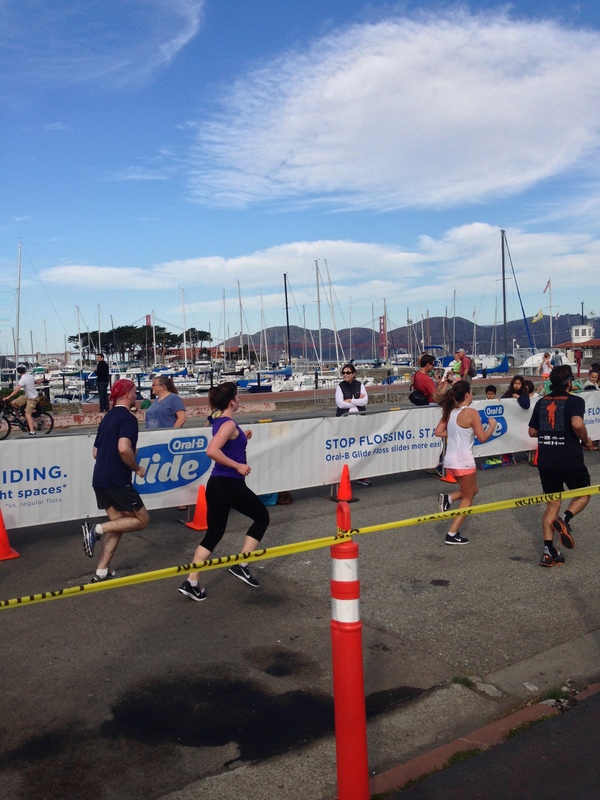 The first mile of the race, up the Embarcadero towards Fisherman’s Wharf, was spent trying to get into a groove as participants would slow way down or stop in front of me. 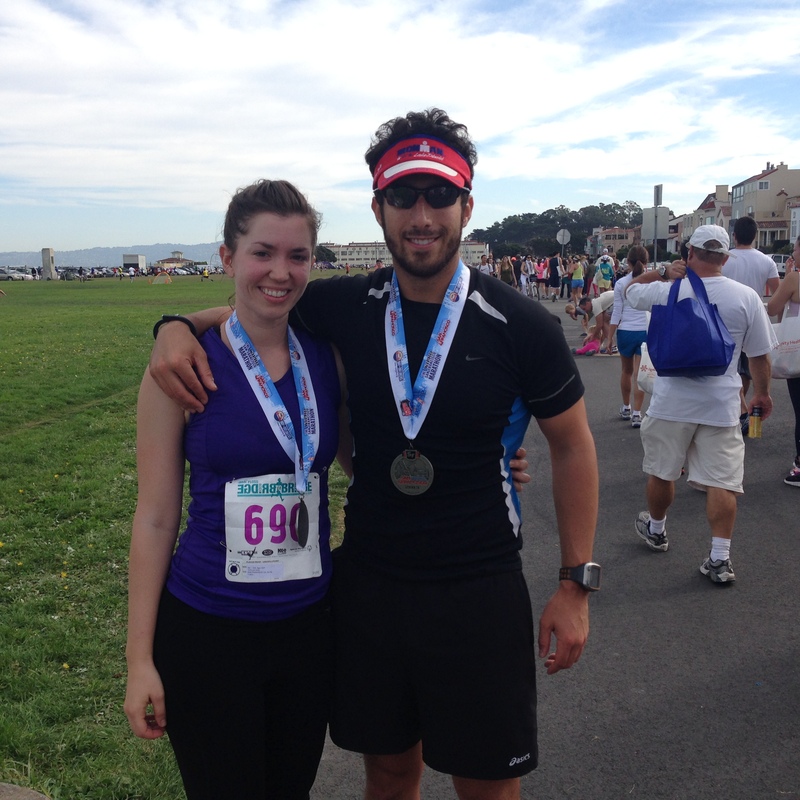 The second and third miles included Fisherman’s Wharf, Aquatic Park, and the dreaded hill at Fort Mason. The last three miles were familiar running turf: Marina Green and Chrissy Field. Jesse passed me headed toward the finish line around mile 4.5, so I knew he was having a pretty good race (He ended up finishing in 45:33. Not quite beating his pace at the Giant Race but still averaging a 7:20). With our SF Originals Series medals. I maintained a pace between 8:30 and 8:50 for every while, which is between my tempo and pace run paces. 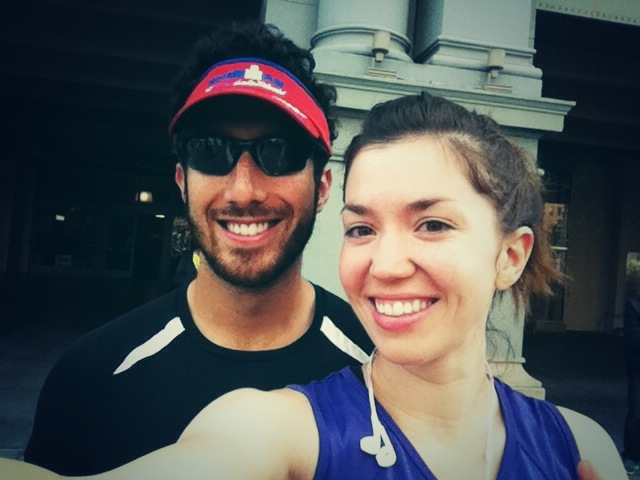 With the half marathon in two weeks, this race served as a good tune-up. According to the Runner’s World race pace predictor, my 53:57 finish time indicates that I should be able to break two hours by the skin of my teeth; it’ll come down to how my body feels on race day. I think a deep tissue massage is in order.